Chicken with Pomegranate – Chef Tom Cooks ! After opening the pomegranate by scoring it with a knife and breaking it open, the arils (seed casings) are separated from the skin and internal white supporting structures (pith). Separating the red arils can be simplified by performing this task in a bowl of water, the arils will sink and the white structures will float to the top. The entire seed is consumed raw, though the fleshy outer portion of the seed is the part that is desired. The taste differs depending on the variety of pomegranate and its state of ripeness. Providing 16% of an adult’s daily vitamin C requirement per 100 ml serving, pomegranate juice is also a good source of the B vitamin, pantothenic acid, potassium and antioxidant polyphenols. Overall, however, pomegranate is not a significant source of nutrients. Prepare chicken for frying. 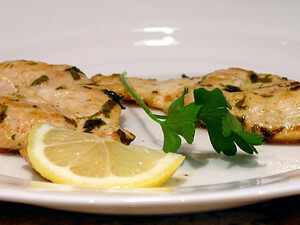 Saute chicken with poultry seasoning in shortening until light brown, set aside. In a large pot saute the onion in 3 teaspoon butter until golden brown. Add tomato sauce and saute for a few minutes. Add water, remaining seasonings, lemon juice, and pomegranate juice. Cover and let cook on low about 35 minutes. Taste the sauce and add sugar if needed. Arrange browned chicken pieces in the sauce, cover and let simmer 20-25 minutes. Serve over white rice. Alan - October 18th, 2007 at 5:07 am none Comment author #890 on Chicken with Pomegranate by Chef Tom Cooks ! I know pomegranate juice is supposed to be very good for you but honestly I've never like it. Years ago in a novel titled Heartburn writer Nora Ephron said of capers 'the thing is that anything that tastes good with capers in it, tastes even Better without capers in it'. That's kind of how I feel about pomegranates. I will check back tomorrow or the next day to see what other recipes you post. deathsweep - October 18th, 2007 at 6:07 am none Comment author #892 on Chicken with Pomegranate by Chef Tom Cooks ! This sounds good. I've always loved the flavor of pomegranates and the straight juice is even better. This is definitely one I will try some day! I like this blog…I'm glad you promoted yourself, I'll be back. Cynthia - October 19th, 2007 at 4:59 am none Comment author #897 on Chicken with Pomegranate by Chef Tom Cooks ! I get pomergranates from a tree in the street behind me. Next time, I want to try juicing them. footiam - October 28th, 2007 at 3:34 pm none Comment author #966 on Chicken with Pomegranate by Chef Tom Cooks ! So surprised you can cook a pomegranate. In my country, we just eat the fruit! Samir - April 23rd, 2009 at 7:28 am none Comment author #14728 on Chicken with Pomegranate by Chef Tom Cooks !